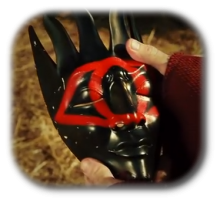 A popular comedy channel on YouTube by the name of Mars Rising recently released a fantastic live-action Zelda fan film, called The Dark Mask. It has some great fighting choreography, a decent bit of humor, and great special effects, and could satisfy any Zelda fan with its references to multiple games in the series. I was quite satisfied with this film. My first praise of it was for the initial fighting scene with the knights. It was not over the top like a lot of other films, and the choreography was simple, but appealing. Of course, props goes to the special effects, like Aghanim’s teleporting graphic, and the magic spheres, but the best thing about this is that it not only references multiple Zelda games, but also adds elements of its own, and innovation is something we should all appreciate. And come on, the Mask Salesman is hysterical. What did you guys think? Would you like it to reach a million hits for them to make that Dark Link fight like they said? Let us know in the comments!